Sampath has spent the past 16 years perfecting the technology. In that time, annual global sales of photovoltaic technology have grown to approximately 2 gigawatts or two billion watts — roughly a $6 billion industry. Demand has increased nearly 40% a year for each of the past five years — a trend that analysts and industry experts expect to continue. This entry was posted in alternative energy and tagged device, solar on September 26, 2007 by Jay. This entry was posted in biotechnology and tagged cancer, cure, medicine, stem cell on September 20, 2007 by Jay. 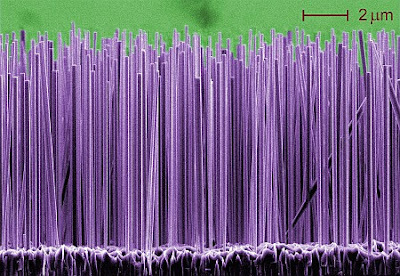 Scientists from the University of Pennsylvania have developed nanowires capable of storing computer data for 100,000 years and retrieving that data a thousand times faster than existing portable memory devices such as Flash memory and micro-drives, all using less power and space than current memory technologies. Tests showed extremely low power consumption for data encoding (0.7mW per bit). They also indicated the data writing, erasing and retrieval (50 nanoseconds) to be 1,000 times faster than conventional Flash memory and indicated the device would not lose data even after approximately 100,000 years of use, all with the potential to realize terabit-level nonvolatile memory device density. Current solid-state technology for products like memory cards, digital cameras and personal data assistants traditionally utilize Flash memory, a non-volatile and durable computer memory that can be erased and reprogrammed electronically. Data on Flash drives provides most battery-powered devices with acceptable levels of durability and moderately fast data access. Yet the technology’s limits are apparent. Digital cameras can’t snap rapid-fire photos because it takes precious seconds to store the last photo to memory. If the memory device is fast, as in DRAM and SRAM used in computers, then it is volatile; if the plug on a desktop computer is pulled, all recent data entry is lost. Therefore, a universal memory device is desired that can be scalable, fast, durable and nonvolatile, a difficult set of requirements which have now been demonstrated at Penn. “Imagine being able to store hundreds of high-resolution movies in a small drive, downloading them and playing them without wasting time on data buffering, or imagine booting your laptop computer in a few seconds as you wouldn’t need to transfer the operating system to active memory” Agarwal said. This may not be as impressive as the Optical Memory 50.000 Times Faster, but if this nano-memory gets here before optical memory… I’ll just make due with the nano-memory for a while. This entry was posted in data storage, nanotechnology and tagged device, nano on September 19, 2007 by Jay. It sounds too good to be true – not to mention the fact that it violates almost every known law of physics. 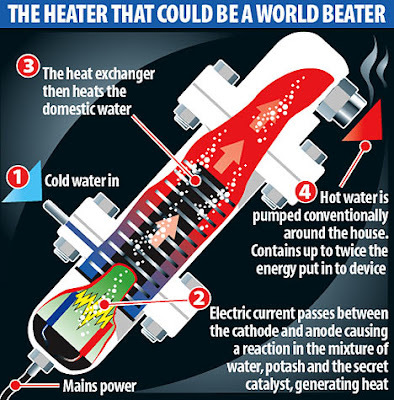 Even the makers of the device are at a loss to explain exactly how it works – but sceptical independent scientists carried out their own tests and discovered that the 12in x 2in tube really does produce far more heat energy than the electrical energy put in. The device seems to break the fundamental physical law that energy cannot be created from nothing – but researchers believe it taps into a previously unrecognised source of energy, stored at a sub-atomic level within the hydrogen atoms in water. The system – developed by scientists at a firm called Ecowatts in a nondescript laboratory on an industrial estate at Lancing, West Sussex – involves passing an electrical current through a mixture of water, potassium carbonate (otherwise known as potash) and a secret liquid catalyst, based on chrome. If the technology can be developed on a domestic scale, it means consumers will need much less energy for heating and hot water – creating smaller bills and fewer greenhouse gases. This entry was posted in alternative energy and tagged device, physics on September 18, 2007 by Jay. 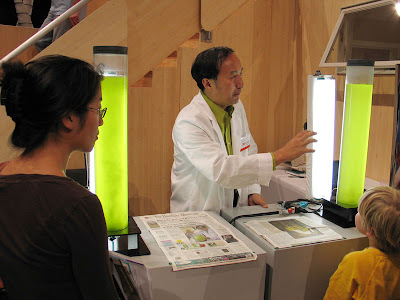 Professor Pengchen (Patrick) Fu is using cyanobacteria to produce ethanol from sunlight, carbon dioxide, and water. This is exceedingly cool since ethanol, a useful fuel, burns cleanly to produce energy, carbon dioxide, and water. See the pattern? It’s a sustainable cycle, essentially storing solar energy in a fuel that we already know and love. This entry was posted in alternative energy and tagged solar on September 17, 2007 by Jay. Dr Indrani Sarkar has has every reason to be excited. Her PhD thesis, which started in 2002 at the Max Planck Institute in Dresden, Germany, has thrown open the doors for developing enzymes that can destroy the dreaded Human Immuno-deficiency Virus or HIV within infected cells permanently. “In laymans terms, it’s an engineered enzyme which recognises sequences in the HIV genome that is duplicated, integrated virus and by the process of recombination, it cuts out the virus from the genome,” says she. 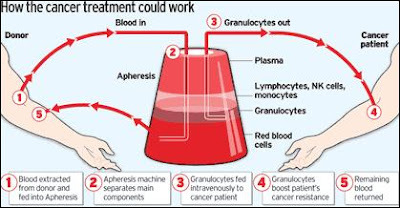 The only way then to cure HIV is to get rid of the virus completely and Tre, the enzyme that Indrani constructed after a year and its 126 “cycles of mutation” totally deplete HIV in the human genome in three months in laboratory conditions. This entry was posted in biotechnology and tagged cure on September 17, 2007 by Jay. Bae’s PLT demonstration produced a photon thrust of 35 uN, which is sufficient for several space missions currently envisioned, and is scalable to achieve much greater photon thrust for future space missions. Applications for PLT include: highly precise satellite formation flying configurations for building large synthetic apertures in space for earth or space observation, precision contaminant-free spacecraft docking operations, and propelling spacecraft to unprecedented speeds greater than 100 km/sec. Bae, looking forward with anticipation, observes, “This is the tip of the iceberg. PLT has immense potential for the aerospace industry. For example, PLT powered spacecraft could transit the 100 million km to Mars in less than a week.” Several aerospace players have expressed intent to collaborate with the Bae Institute to further develop and integrate PLT into civilian, military, and commercial space systems. This entry was posted in quantum / physics and tagged future, synthetic on September 16, 2007 by Jay. There is no doubt that we are in the midst of many changes in the world of marketing and advertising as new technologies are changing the way we view and interact with businesses and products.As copywriting professionals, we feel these changes too. Attention spans are shrinking, new mediums are developing and competition is increasing. Staying on top of it all has become essential in staying competitive. This entry was posted in gadget on September 13, 2007 by Jay. The way fresh water is supplied to disaster-hit regions could be revolutionised after an Ipswich-based businessman invented a £190 bottle that makes foul-smelling water drinkable in seconds.Michael Pritchard hopes that the bottle could be a life-saver for refugees in disaster regions where access to clean drinking water is vital. However, the military are already latching on to his idea. Four hours after Mr Pritchard launched his new “Life Saver” bottle at the DESI defence show in London yesterday, he sold out his entire 1,000 stock. “I am bowled over,” he said. Conventional filters can cut out bacteria measuring more than 200 nanometres but not viruses, which typically are 25 nanometres long. 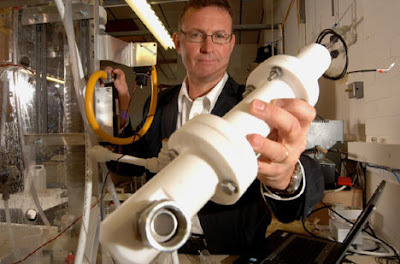 Mr Pritchard’s bottle can clean up any water – including faecal matter – using a filter that cuts out anything longer than 15 nanometres, which means that viruses can be filtered out without the use of chemicals. This entry was posted in gadget, nanotechnology and tagged nano on September 13, 2007 by Jay.